2 Look at the picture and translate the words. 3 Try to give the right answers. 4 Read arid check your answers. Elmer, an Anglo-Saxon boy, was hiding in a big tree. He had promised his father to stay at home. But on that early morning of October 14, 1066 he had secretly come to watch a battle. The battle was going to change Britain for ever. Now Elmer could see his father with his long shield. He was one of King Harold Godwinson's bodyguards. He had joined the king's army that had just come back from fighting the Norwegians in the north of Britain. 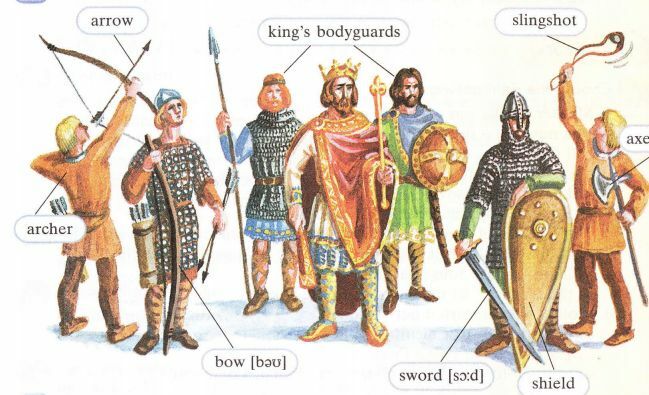 At the front of the army the Anglo-Saxon soldiers made a wall of shields. Below them, at the bottom of the hill, were the Normans. A few days before things had been so very different. It had been a peaceful, sunny afternoon, and Elmer had been fishing in the little river near the house. Suddenly a horse had stopped in front of Elmer's father. "My lord," the rider could hardly breathe, "Normans!" "Five hundred, six hundred, maybe more. They have horses with them and archers - hundreds of them." "So they have come," said Elmer's father with a sigh. "William and his Frenchmen!" "Why does everybody want to fight us, Father?" Elmer asked. "Because England is a rich country, son, and because our last king, Edward, couldn't decide." "Who should be the next king. Edward didn't have a son, and William and Harold are both Edward's relatives, you see. First he promised his crown to William of Normandy. Then, many years later, when he was dying, he left the throne to our King Harold. Now Harold has become our king, but William thinks that England is his. There was another man, who also wanted to be the king of England, the Viking Harald Hardrada. Our king Harold has just beaten him. We are not ready for another battle." The Norman war cry "Ut! Ut! Ut! (Out! Out! Out!)" interrupted Elmer's thoughts. Again and again the Norman arrows fell against the English shield wall. Again and again the Norman horses charged up the hill, but the English drove them off with their great axes. Nothing could break the strong shield wall. Now the Norman soldiers were getting nearer. The Anglo-Saxons waited until they were close. Then they brought out their secret weapon — the slingshot. The right side of the Norman army began to go back. Elmer's heart jumped with joy when they turned and ran! Many of the Anglo-Saxons ran after them. They wanted to chase the Normans back into the sea. But at the bottom of the hill the rest of the huge, well-trained Norman army was waiting. It was a trap. They attacked the Anglo-Saxons who had run down the hill and killed them all. After that things began to get worse for the Anglo-Saxons. They lost courage. The Norman archers began to shoot their arrows high into the air. The arrows fell at the back of the English army. One of the arrows killed King Harold. It hit him in the eye. He died and with him Anglo-Saxon Britain died too. Britain now belonged to William of Normandy. Elmer ran far, far into the forest. He didn't go home, because he was scared of the Normans. He lived on berries and fish. One day he found a ring in the river. He picked it up. The ring shone brightly and there were two Celtic snakes on it. Elmer put the ring on his finger and suddenly he felt better. He was not scared and tired any more. He decided to go home. When Elmer got to his father's house there was nothing there: only burnt ruins. Somehow (каким-то образом) he understood his family were dead. "Hey, Elmer!" a voice shouted from the forest. It was Sigurd, one of his father's servants. Elmer saw tears in his eyes. 'After the battle... the battle," Sigurd said, "the Norman soldiers came here. They wanted food, animals, chickens - anything. Some people tried to stop them. That was a mistake. They burnt the house. They killed everybody. Your family, my family. You can see... I ran away into the forest. There was nothing I could do. When I came back we buried them — one big grave for everybody:' Sigurd began to cry. 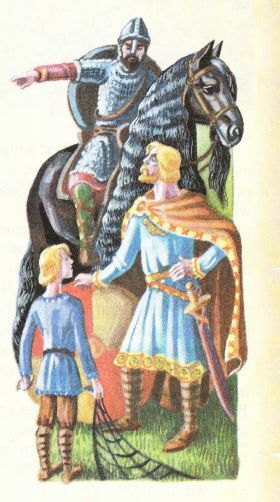 Elmer put his hand on Sigurd's shoulder. "One day the Normans will be sorry?' he said. "I will wait. You will wait. It doesn't matter how long. We will never forget 14 October, 1066." 5 Choose the right answer. More than one answer can be correct. — the name and the nationality of the King of England who had died before the battle. — the name and the nationality of the man who was the king of England on 14 October, 1066. — the name and the nationality of the man who had just lost the battle in the north of Britain. — the name and the nationality of the man who became the King of England after 14 October, 1066. 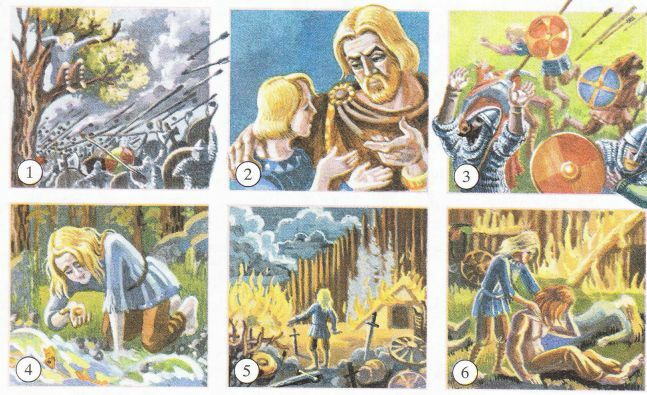 7 Why were there so many people who could become the king of England? Bayeux Tapestry - гобелен из аббатства Байё (Франция). На гобелене XI века длиной 70 метров вышиты эпизоды завоевания Англии норманнами. Rex - в переводе с латинского означает король. 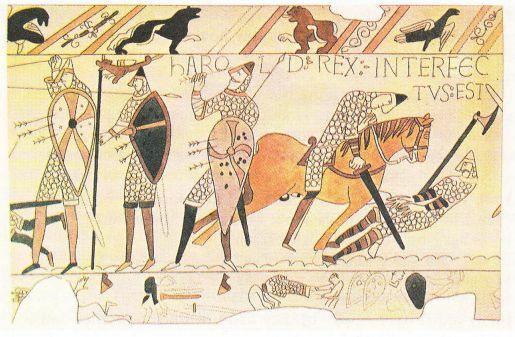 8 Look at the Bayeux Tapestry on this page and on page 1 93. Find Norman soldiers, English soldiers and King Harold Godwinson. 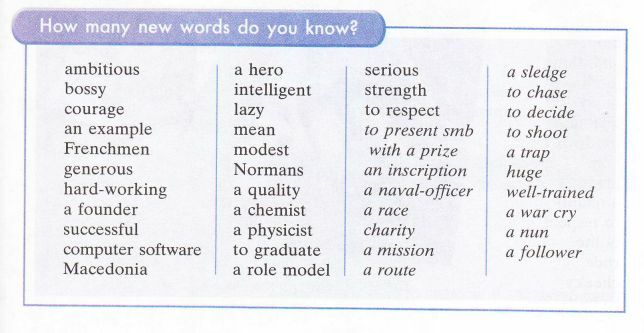 Explain your answers. 9 Fill in the gaps with the names Harold Godwinson, Edward, Harald Hardrada, Hastings, William of Normandy. Put the events in the correct order. A Look at the pictures and write a short story about Elmer. Model:Elmer was the son of a rich man. К. И. Кауфман, М. Ю. Кауфман Английский язык: Счастливый английский.ру / Happy English.ru: Учебник англ. яз. для 7 кл. общеобраз. учрежд.— Обнинск: Титул, 2008.— 288 с: ил.